The popularity of gerbera daisies among flower lovers has steadily risen over the last several years, so much in fact, that many growers have had to increase their production of this colorful flower in order to meet the demand. Sending a bright, colorful gerbera daisy bouquet is a thoughtful and trendy way to celebrate any occasion. Because of their big, bold flowers, that come in a rainbow of colors, they have also become a very popular wedding flower, especially with DIY brides, who are able to buy gerberas wholesale at very reasonable prices. Whether you are buying gerbera daisies for yourself or sending them as a gift, here are 7 underwaterhould follow to ensure your gerberas will last as long as possible. Remove the protective plastic cups (if used) from the flower. While holding the stems underwater in a sink or under running water, cut about one inch off each stem with a sharp knife or shears. DO NOT let the newly cut end dry off before transferring them to your arrangement or other container. Water, to which a good floral preservative has been added, is the best solution in which to arrange fresh cut gerbera daisies. Using floral preservative as recommended will provide additional days of vase life. Avoid using water from a water softener. Immediately after the stems are cut, place your gerbera daisies in a deep vase of warm preservative solution (about 100 degrees F). If possible, leave them in a cool, dark room or refrigerator to hydrate or ‘condition’ for 2 or 3 hours before arranging. Temperature is key to the longevity of gerbera daisies. 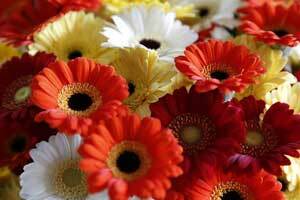 Display your fresh cut gerbera daisy arrangements in a cool area out of direct sunlight and drafts. Gerbera daisies are thirsty flowers. It is important to check to see that the vase is full and add preservative solution often. 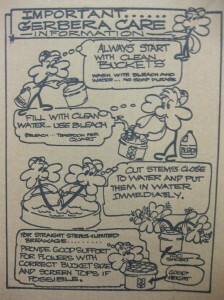 Be sure any floral foam materials used are completely saturated and the container is full daily. Gerbera stems are highly susceptible to bacteria blockage. This may cause the head to droop over. 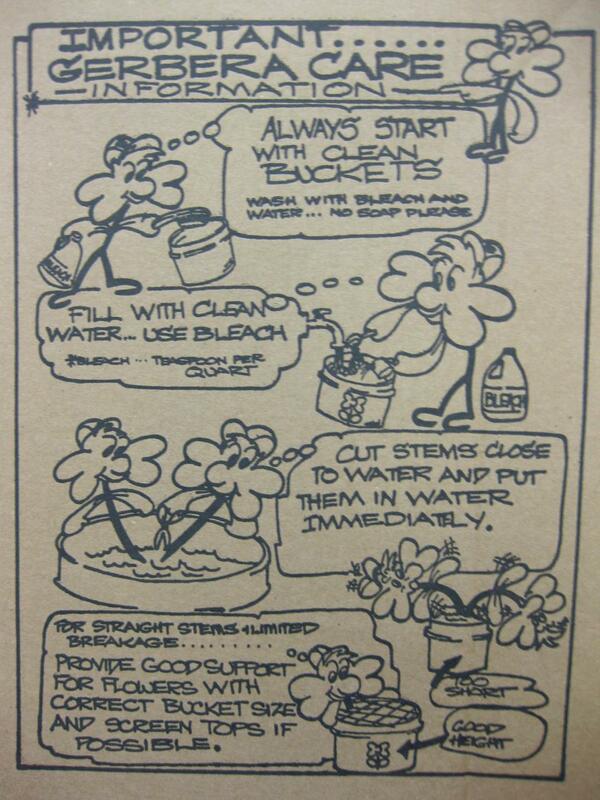 Use clean water and replenish preservatives every 1 to 2 days. The video below includes a few of the “secrets” that professionals florists use when processing, re-hydrating, and handling damaged gerbera daisies. Following the steps outlined above and in the video will help you to be able to extend the enjoyment and value of your gerbera daisy purchase. Do You Need Country Themed Wedding Ideas?